Wow, I can't believe it is over. We have a new President and a new chapter in history has begun. Changes are already happening, and although I can't help but wonder how it will all work and if it will all last, in the words of William Hamrick, I remain "cautiously optimistic." We got to the Metro station at 6:45 a.m. and waited for 45 minutes to catch a train downtown only to have them full up. I even tried just getting on one as really there was plenty of room if people in the middle would have been a little more willing to set aside their belief in personal space. The next thing I knew, someone had thrown a banana peel at me (no kidding, from a real banana) and someone else shoved me off the train. For a second I was so shocked I didn't know what to think, then the next second I couldn't stop laughing--someone had thrown a banana peel at me! We ended up having to go out to go forward. By this I mean we hopped on an outbound train to a station that was almost empty so we could get on a train going in the right direction. And it worked! After an hour and a half, we had meet four new friends and were downtown. 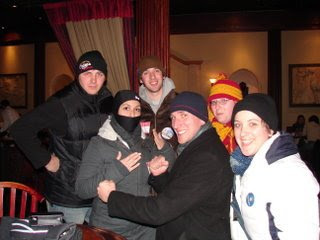 We buddied up with two local guys and a guy and girl who had driven in from Michigan, calling ourselves Team McPherson Square because we decided to stick together after agreeing the best place to get off the train was the McPherson Square Station. We all kept tabs on each other to make sure no one got lost/left behind and made decisions together. After seeing the masses walking to the Mall, we figured it was too late to get into the inauguration, so we made plans just to get on the parade route and get decent seats. But we kept getting herded and sent in different directions by security. It was quite the sight to behold. 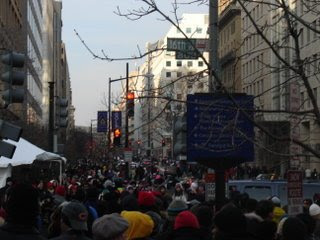 Before we knew it, we had crossed over the parade route and got spat out onto the Mall. 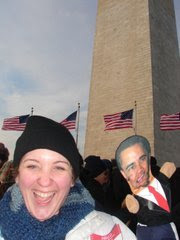 We ended up about 50 yards in front of the Washington Monument. 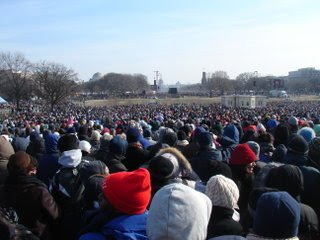 We were packed shoulder-to-shoulder, but we could see the jumbo-trons and hear the speakers, and if we shifted the right way to see between heads, we could make out the Capitol Building in the distance. You may think you saw how many people were on the Mall yesterday, but let me assure you, the pictures were all taken around 11 a.m., well before people stopped flooding the mall. The crowd just kept growing, and the excitement grew exponentially with the numbers. We had all come to see history being made, and in that moment, we transcended cultural beliefs, places of origin, religion, creed. We were all there with a hope for something different, something more. While that may sound kinds of naive and hokey, that was truly the feeling in the crowd. They only time I didn't feel unity among us was when former-President George W. Bush came on stage. In fact, I was a little disappointed in the spectators. While I don't agree with a lot of decisions Bush made during his administration, I understand that we all had a voice in putting him in office. We asked him to be our leader, and he took that burden upon himself for eight years. He also deserves the respect the office of the President of the United States deserves. While I believe in freedom of speech, I also believe in self-control and knowing the correct time and place to voice your opinion. And a ceremony celebrating the peaceable transfer of power from one President to the next is not the place to boo and sing "hey, hey, hey, good-bye." But after that, things calmed down and excitement returned. Cheers echoed off the monuments that honor the leaders of the past when our leader of the present appeared on stage. The excitement of the moment settled over me more warmly than my winter clothing and the blanket I had wrapped around myself. I knew in that moment, in that place where history had been made time and time again, I was witnessing something great. Something bigger than the crowd that had gathered. 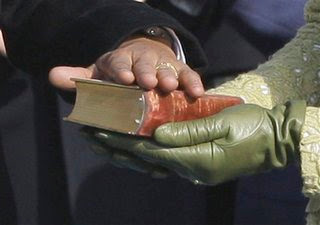 And when Obama placed his hand on the Bible once used by Abraham Lincoln to take his oath of office, I suddenly became aware of something much different. We were placing a huge burden of expectation on this one man. We are expecting him to change the world--we were probably asking more of him than any president in living memory. And I think, as he fumbled over the words he was asked to say, our new President knew it as well. 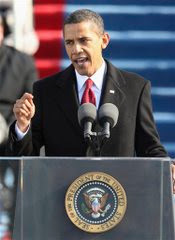 His speech was powerful, probably made more powerful to me by knowing I was there when he spoke those words. He had the authority of the office he now held. And while I don't agree with everything he said or with all of the things he has promised, I know that he is now our President. He is the new face of our nation, and I pray that we will be able to live up to all of the faith we have put in him. Spirits continued to run high as we made our way off the Mall. I was surprised by the patience of almost everyone (of course there were a few people who complained and a few others who were rude along the way), but we eventually made it to the White House where we saw the organizations lining up for the parade. 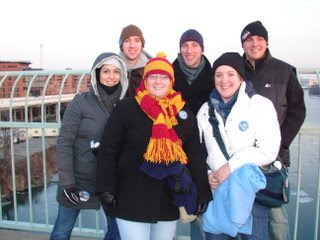 By that time, the parade route was closed to any more pedestrians and we were popsicles, so we just kept walking until the feeling returned to our toes and the adrenaline wore off enough that we all became hungry. We hit 18th and M only to realize we were not getting on the Metro any time soon, especially when we received a text about a woman who was trapped under a train on the red line and the stop was shut down until she could be rescued (on a side note, she was later freed and only had minor injuries). So we just kept walking all the way into Georgetown. We finally found an Italian place that had less than an hour wait, and six strangers who had become friends in one morning, sat down to eat and watch the parade and news on the bar television. We continued out walk through Georgetown and finally crossed over Francis Scott Key Bridge into Roslyn. A quick stop at the Metro information booth revealed that the trains were still incredibly full and delayed, so we just kept walking until we got back to my car. So 12 hours and 5.88 miles of walking, we ended up back at the beginning. That is a day I will always remember. 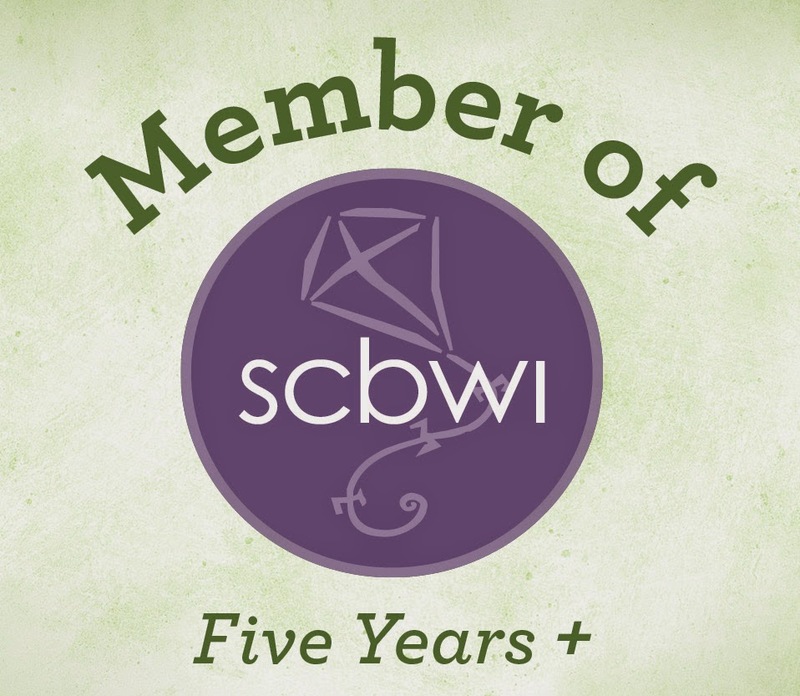 Now I just need to get back to work and wait another four years until we can do it all over again.